Now of course at this point the 917/30 is producing well over 1000bhp and the upgraded bodywork from the 917/10 to the 917/30 has made the car more stable at high speeds. Penske is taking the car to get the record for the highest average speed for a closed course lap. Now you might think somewhere like LeMans might be decent with the massive Mulsanne Straight (which was still 3.7 miles long at the time), but it still had too many corners to slow you down and reduce your average speed. No, this car would stay in its Can-Am home of the USA to hunt down the record. Talladega SuperSpeedway was where they were to beat AJ Foyt’s record of 217.854 mph in an Indycar. Talladega was also the place where the famed Charger Daytona with the tall wing broke the 200 mph barrier. Unfortunately Donahue and Penske’s car was fraught with issues. The 917/30's engine was not built to drive full throttle for that long. This being the early days of turbocharging, the engine was overheating. With Porsche’s help, they re-engineered the drivetrain. They had Porsche rebuild one of their 5.4L engines and had them also prepare a 5.0L engine with the thought that the 5.0 could survive longer. They also created large intercoolers at the rear of the car. Donahue also requested a larger turbo, hoping to help keep the air cooler. The car was running so hot that the tail momentarily caught fire when Donahue came into the pits without doing a cooldown lap. Finally after 3 days of test runs, Donahue had broken the record of 217 avg speed by obtaining 221 on the Talladega 2.5 mile oval. After testing they found the car had achieved 1213bhp with over 20psi of boost. Sadly, Mark Donahue would die in a crash during F1 testing in Austria just 10 days after his record. 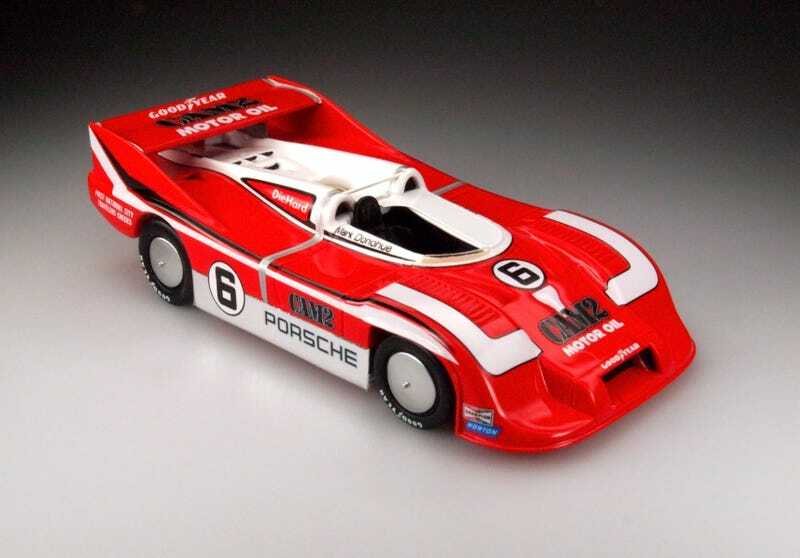 Even with his untimely death he is considered one of the best American race car drivers, it seemed he could perform at the top no matter what car you put him in, and he was an engineer to boot, helping Porsche set up up their wildly successful can-am cars. Well I hope you all enjoyed this story as much as I did. It really does seem like racing back in those days was way more exciting than what we have now. Not many racers could do what they did and cars aren’t making the massive leaps forward like they did then. Oh, finally, this is a 1/43 model (team 1/43!) from Bizarre models, a sub-brand of Spark. They tend to focus on land-speed cars and being a child of Spark, the details are excellent.